Pebble Peggy. Unfortunately, Peggy’s nose was almost invisible. Like a seachange, but with forests. Horses over the back fence, forest walks, lots of camping grounds, excellent roads and little traffic. A wonderful sense of freedom. Have abandoned overpopulated Sydney to enjoy the peace of Northern Tasmania. Every day I meet people from the mainland who came and fell in love with the place – they are disgustingly happy and never want to leave. We joined that group within half an hour of landing. Tomorrow is the anniversary of 100 days here. A champagne day. 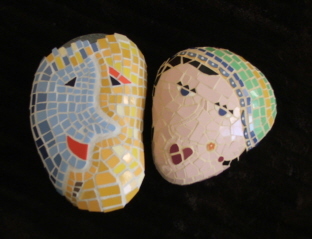 Within a few weeks I found a way to follow one of my non-writing hobbies, and now it’s ten weeks since my first market stand, making and selling mosaics. Every Sunday I go to the market at the Axeman’s Hall of Fame in nearby Latrobe, and make mosaics from 9am until 3pm. People stop and chat, give me compliments and encouragement. Selling is almost the least important reason for being there. I still write and keep a journal, looking for a critique group to join at present. You can share your own lifestyle change by leaving a comment. Image | This entry was posted in Lifestyle, Mosaics, Tasmania and tagged freedom, lifestyle, mosaics, tasmania, tassie, treechange. Bookmark the permalink. Peaceful. Tasmania is peaceful and beautiful. I can see how magically well Tassie has been treating you. And great piece of writing. Crafting or writing you always … YOU!